Many websites use the rel nofollow tag to prevent PageRank/link benefit from passing through links, some of the most popular blog platforms and content management systems like WordPress, Drupal and Joomla automatically add nofollow links without webmaster interaction! Unfortunately rel nofollow doesn’t protect PageRank (as it once did), it deletes PageRank! Google moved the goal posts to prevent PR sculpting via rel nofollow. 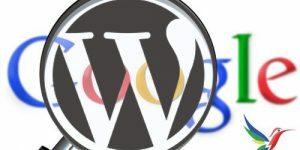 I use WordPress as an SEO CMS and although WordPress out the box with almost any WordPress theme and no WordPress SEO plugins is better than your average website from an SEO perspective, WordPress is clearly NOT designed by SEO experts for maximum search engine results. The WordPress developers are WordPress experts, but they aren’t WordPress SEO experts. WordPress is good SEO wise, but it’s not awesome: just look at how core WordPress uses rel=”nofollow” with comments that we’ve known for years deletes valuable PageRank/link benefit. 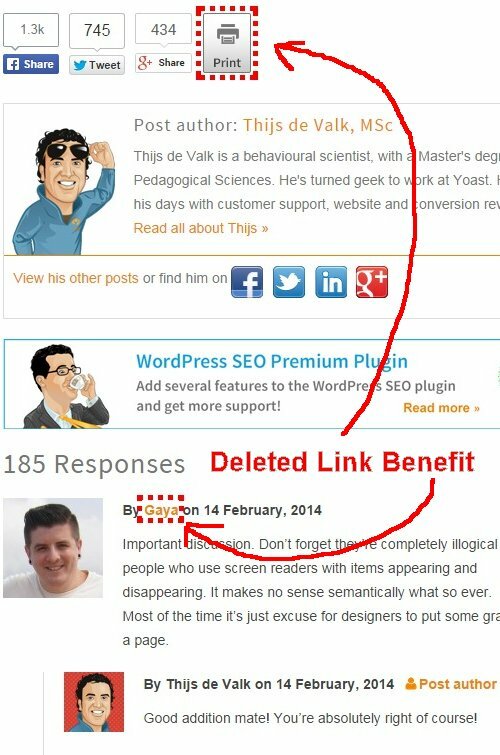 Yes, WordPress out the box deletes your valuable link benefit (you work hard to generate backlinks and WordPress wastes a lot of it!) and not one of the popular WordPress SEO plugins or themes deals with the rel=”nofollow” problem, in fact in many cases (Yoast and All In One SEO Pack for example) make it much worse by adding more nofollow links and noindex and nofollow robots meta tags in a vain attempt to sculpt PageRank through a site! If you take anything away from this rel nofollow tutorial, it’s DO NOT use nofollow. For those confused about the code a lack of rel=”nofollow” is a dofollow link, you do not add rel=”dofollow”. Unfortunately Google deletes the valuable link benefit that would have passed through the text link, so every nofollow link from a webpage still consumes your valuable PageRank that would have gone (if the nofollow link didn’t exist) to your do follow links. PageRank Sculpting with Nofollow no longer works (used to). Many blackhat SEO’s used nofollow to basically silo SEO their links quickly (lazy way to do SEO basically) and it worked, Google realized passing the link benefit that would have gone through the nofollow links to the do follow links was a mistake and changed how they treat nofollow links. A simple example, imagine a page with 10 links and 5 are dofollow and 5 are nofollow. The 5 dofollow links consume 50% of the PageRank, the nofollow links delete 50% of the PageRank. Remove the 5 nofollow links and the 5 dofollow links consume all the PageRank and pass twice as much link benefit. The above is how nofollow works in Google 2014. Do not use rel nofollow. Consider when using a popular WordPress SEO plugin and you see an option to nofollow categories and tags, if you use this SEO damaging feature you are deleting your hard earned PagRank! Why would you do this??? If you currently run one of the popular WordPress SEO Themes and/or SEO plugins mentioned above, go to http://linkcounter.submitexpress.com (Quick SEO Tip: note how I’ve NOT turned this into a clickable link, if you don’t want a link to pass PR add it as plain text, this will work with any WP theme) and enter your sites pages, try the home page, a category, a post, a post with comments etc… and see how many PR deleting rel=”nofollow” links you have. Note the tool isn’t 100% accurate, doesn’t count internal nofollow links (these still delete PageRank) and struggles with some link formats, for an accurate count use a browser addon (Firefox and Chrome has some good nofollow finding addons which add styling to the nofollow links: see next screenshot) or view source and count them. Try these URLs to see how much damage so called SEO themes and plugins are doing or to be more precise not preventing (the rel=”nofollow” added to comment links are added by WordPress core). 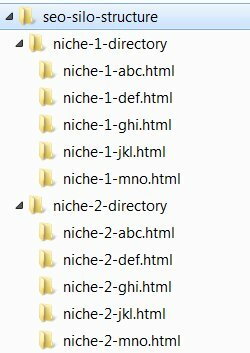 http://semperfiwebdesign.com/blog/all-in-one-seo-pack/all-in-one-seo-pack-pro-version-2-1-released-today/ – developers of the All In One SEO Pack Plugin: Feb 2014 around 60 nofollow links, that’s around 1/3rd of link benefit deleted! http://diythemes.com/thesis/version-21/ – developers of the Thesis theme: Feb 2014 almost half the link benefit is deleted by the Thesis theme because it doesn’t remove nofollow! Check any page of this site, you won’t find any rel=”nofollow” links. On most WordPress sites NOT running WordPress SEO Plugins it’s posts with comments that have most nofollow links, though if you check the pages above you’ll find there are nofollow links added to Twitter and Facebook links that were probably added by the site owners rather than WordPress core. If you have a post with 20 comments it could be deleting the SEO link benefit of 40 links! Add to this what the popular WP SEO plugins could add if the plugin users don’t understand nofollow/noindex and you could be deleting over half your valuable link benefit from a page! Don’t forget to run this site through the nofollow link tool, you won’t find nofollow links here. The SEO package I use and develop removes all core WordPress rel nofollow links. 13 responses to What is Nofollow? The five dofollow links will get only 1/5 each even if I set the other 5 dofollow too. How does using nofollow have a negative effect on my SEO? And where do I find your company details (Address, telephone, e-mail asf)? Using the 5 dofollow and 5 nofollow links example if you create a page with this ratio of dofollow to nofollow links half your link benefit that flows through that page is lost. If the 5 nofollow links are to say affiliate links or sites you don’t care about replacing the nofollow with dofollow has no impact on your 5 dofollow links link juice wise. There are other issues to consider, if you have a page about a WordPress SEO Theme and the 5 nofollow links go to relevant sites about WordPress, SEO and Theme and you use anchor text for those links relevant to your pages SERPs it will help your pages SEO because off page anchor text is important. If you go along with the approach of linking to relevant resources, where are you going to find them? Most likely Google, so you’d search for “WordPress SEO Theme” and link to the top resources (last time I checked this site was top 10 for that SERP) because that indicates you are part of that niche. I’m sure you can see the problem with this is a lot of people use this approach, those at the top get more backlinks with great anchor text for free making it even harder to compete with them! Even if you decide I’ll link to the results at page 10, your backlinks help them link benefit wise, not you and they climb the SERPs. You can see there’s a cost/benefit to using nofollow/not using nofollow for links to sites you don’t care about. What I try to do is link to relevant pages in the same niche I own, not always possible, but better than wasting link benefit on a competitor. For links you don’t want to pass link benefit to there’s a Stallion solution, Stallion has link cloaking built in which is perfect for affiliate links – Stallion Theme Cloak Affiliate Links Tutorial. On my sites that have affiliate links I cloak them, if Google hadn’t changed how they treat nofollow I’d nofollow them, but it changed and I’m not wasting link benefit on affiliate links or nofollow. Stallion also ‘hides’ comment author URLs, they are form buttons with CSS styling to look like text links, they do not pass nor delete link benefit. Exception to this is the admins URL, that passes full SEO benefit since the owner of the site decides where that link goes. On contact details I provide support via comments here and email, best email to use is the Gmail one that’s on the main Stallion options page. As I use Clickbank for payments I have to supply a valid phone number in the order emails and being in the UK with mostly US based customers have been woke at 3am in the morning! How Does Nofollow Delete Link Benefit? +++ how can link benefit be deleted? One page with 10 links (5 “nofollow” link juice 10) would have given the 5 “dofollow” links 2 points link juice each before the Google change of policy. As I understand, now the 5 “dofollow” will only get 1 point link juice each, the 5 “nofollow” links will get no link juice at all, right? As I see this, there’s only 5 points link juice passed as in opposite to the 10 points earlier. Where do the remaining 5 points link juice go? As I see it – and here I’m obviously wrong – they are simply not passed on. Five quid not spent – still in my pocket. But as I understand you: they are lost! They’ve somehow evaporated into thin air and diminish the link power of my site. +++ Do “nofollow” links harm your site? –	Never use them at all? –	What about linking to sources like Wikipedia? –	Would you advise me to change all my “nofollow” links? –	What is the overall SEO impact: are we talking catastrophe or annoyance? BTW: have you ever thought about opening a forum? So it is not used by the 5 dofollow links, it’s gone, kaput, deleted :-) In the examples used 50% of the pages link benefit is lost for no gain! Years ago it used to be the nofollow links as far as Google was concerned didn’t exist, the anchor text was supposed to be ignored and the link benefit used by the dofollow links. Currently Google is supposed to ignore the anchor text of nofollow links (there’s been edge cases where it’s counted) and delete the link benefit. This means there’s nothing but SEO negatives to using nofollow, not only does it delete the link benefit you also don’t get the anchor text benefit or the SEO benefit of linking to related niched pages! On my sites I never use nofollow, you will note the link to Matt Cutts blog post is body text (Stallion feature, you can stop WordPress converting URLs to clickable links), either add a non-clickable link, cloak the link or pass link benefit (dofofollow). There’s a Stallion feature that can automatically convert your nofollow links to cloaked links (I have about 90 WordPress blogs, probably 100,000+ comments, had to find an automated solution :-)), so if you have loads of nofollow links Stallion can convert them on the fly (the database isn’t edited, switch themes they revert back to nofollow) until you find the time to edit them. There’s a Stallion feature not to nofollow clickable comment links (WordPress by default adds nofollow) like this one SEO Tutorial so if you want to use links within your comments without adding nofollow… Does open you up to link SPAMMERS but I have my sites set to moderate any comments with even 1 link and only use this feature on sites I’ll add clickable links on (only a few). The SEO impact of nofollow can be irrelevant or catastrophic, depends on your setup. For example if you’ve used WordPress SEO Plugins like Yoast WordPress SEO and have set the plugin to nofollow all archive links that’s a LOT of nofollow links, it wouldn’t be difficult to use Yoast WordPress SEO and similar plugins to have more nofollow links than dofollow which would be catastrophic! In comparison a page with 99 dofollow links and 1 nofollow link wastes just 1% of that pages link benefit, not a big deal. If you are adding nofollow links to relevant resources (like Wikipedia) believing it has a positive SEO impact you are wrong. All you are doing is deleting your hard earned link benefit. I always aim for zero nofollow links, don’t see the point in deleting link benefit. So let me repeat what I understood. When a link is needed, use a text link. Thus a source is credited (like Wikipedia) but no link “juice” (link benefit) wasted. That’s really hard for me to understand. It means if the site has a link benefit of 100%, after using “nofollow” it will be only 99,84% asf. Although in my nincompoop opinion, link juice simply isn’t used thus saved, your SEO expert opinion clearly states: it is lost! So, I will have a lot of links to convert into text links on my site – but I’ll do it. Dofollow clickable text links pass full SEO benefit, PR/link juice whatever you want to call it is passed (spent). Dofollow clickable image links, as above. Nofollow clickable text links pass no SEO benefit, deletes the PR/link juice that would have been passed if the link was dofollow. Nofollow clickable image links as above. Body text link, non clickable (like www.example.com) is not a text link, has no SEO impact PR/link juice wise. Will be treated as body text. Many link cloaking scripts use clickable text links that 301 redirect to the URL, the sort that use www.example.com/go/here/ and redirect to another page (many affiliate marketers use this type of link cloaking) are treated as clickable dofollow text links, so they pass full SEO benefit minus a small dampening factor that’s added to 301 redirects. All recognisable clickable links receive a fair share of the link benefit available from the page, if there’s 1,000 PR points (arbitary unit for calculation reasons) available from your average PR5 page and there’s 10 clickable links from the page, each clickable link (whether nofollow or dofollow) will use 1/10th of the PR points and with 1,000 PR points available each will receive 100 PR points (1,000 divided by 10). Another example 1,000 PR Points 50 clickable links from the page, each receive 1/50th or 20 PR Points (1,000 divided by 50). If your average PR4 page has 300 PR Points you can see less PR points are passed per link. You can see how much damage a particular nofollow link causes depends very much on the page the nofollow link is on. A page PR2 page with 300 dofollow links and one nofollow link isn’t worth worrying about. A PR7 page with 5 dofollow links and 15 nofollow links is a major problem, that page would be deleting 3/4s of it’s PR and as it’s PR7 that’s a lot of wasted link juice. It’s irrelevant whether we think it makes sense the link juice of nofollow links is deleted, doesn’t make sense to me, but Google via Matt Cutts has confirmed this is how Google works, it’s as close to an SEO fact (Matt Cutts could be lying I suppose) you get with Google SEO. So we have to make every link do follow? I have always heard that google dosent like affiliate links. Can you explain? No I’m not saying make every link dofollow, I’m saying make no links nofollow. there’s a BIG difference, I sure as hell ain’t sending link benefit to affiliate sites!!! There’s built in link cloaking in Stallion that works great with affiliate links, I have tens of thousands of Stallion cloaked affiliate links on my sites, some are manually added others automated. If you are an auto blogger using Massive Passive Profits Plugin or WPRobot Plugin Stallion converts the nofollow links those plugins tend to generate on the fly, few clicks of the mouse and the vast majority of affiliate links generated by the above plugins are cloaked. Stallion also has a feature to convert your nofollow links to cloaked links as well (for any site not just autoblogs) on the fly. So if you have a blogs with thousands of nofollow links a few clicks of the mouse and Stallion converts them on the fly to cloaked links. All the above built in on the fly features do not change the nofollow links code, it uses PHP code I wrote to convert the nofollow links to the Stallion cloaked link code just before a browser or search engine bot sees them. Turn the features off or change themes and the nofollow links are again readable by search engines etc… this also means switching a site from another theme to Stallion can remove the majority of your unwanted nofollow and affiliate links without that much work. Stallion Theme Cloak Affiliate Links Tutorial. BTW as a Stallion Theme user without understanding any of the above or turning on any of the above features Stallion may have already removed thousands of nofollow links from your sites. On the vast majority of WordPress themes comments include nofollow links, the comment author links for example, Stallion uses code (post forms) styled like text links instead of text links. The only difference is you can’t right click and open in new window with them, try it with your Bill Roberts link in the comment above, Google etc… doesn’t read it as a link, but visitors can click it. That link passes no link benefit and doesn’t delete any either like a nofollow would. The “Stallion Theme Cloak Affiliate Links Tutorial” link above is a dofollow link, there’s a Stallion option to turn off/on nofollow for clickable links within the body of comments. I have it turned off (off means links are dofollow) on this site so I can add links to my sites that pass link beenfit. Yes, users can add their own dofollow links easily, but I have moderation set to mark comments with 1 or more links as pending and will remove any clickable links manually. If I wanted to allow clickable links that passed no link benefit and didn’t use nofollow I’d turn nofollow on (yes on) and turn link cloaking of comments on which will convert the nofollow links within the comment body into Stallion cloaked links on the fly (so WordPress adds nofollow and Stallion converts it on the fly to a cloaked link because it’s nofollow). So there’s plenty of options to deal with nofollow links. You are bit inacurate – Yoast gives You option to set categories as noindex, dofollow by default, or turn them off at all ;-) I have not seen nofollow in SEO by Yoast settings at all. Edit or create a new post, under the WordPress SEO by Yoast Form click Advanced. Meta Robots Follow : Nofollow option. If you tick that box a robots meta tag will be added to the page that tells Google to nofollow all links from the page. Note how there’s no documentation of the SEO damage adding nofollow links have to a site. If I used the Yoast WordPress SEO plugin on this site and edited this post and used the nofollow option, Google would index the post but wouldn’t pass any SEO link benefit (PR) through to other parts of the site from internal links. No SEO expert in their right mind would add such a damaging SEO option to a WordPress SEO plugin without explaining the damage it can do. I can’t think of a single use for this option? Why would anyone want ALL links on a page to be nofollow? Look above the comments on this page how I have over a dozen links to WordPress SEO tutorial articles, those links would pass no SEO link benefit if I used Yoast and ticked that little box. There will be thousands of webmasters who don’t understand SEO clicking that box thinking it’s a good setting. I was in a discussion recently on the Warrior Forum and one of the regular members had been using the Yoast noindex,follow robots meta tag option (another option) on archives in the mistaken belief Google couldn’t see the content of the archives, so that would prevent duplicate content issues. Didn’t understand what noindex is, thought it meant the links to the archives would be ignored.